This particular model #602 Dress Form is used by top Fashion Institution around US along with our 601, These two models are the leading dress form in United States (FIT, FIDM, TradeTech, Otis, Parson…etc and many of the Top Fashion College use our dress form in class) Featured on Project Runway Sponsored Dress Form to Top Fashion College on a worldwide basis BUY with Confidence! Professional Dress Form with 100% Linen Fabric that is pinnable. 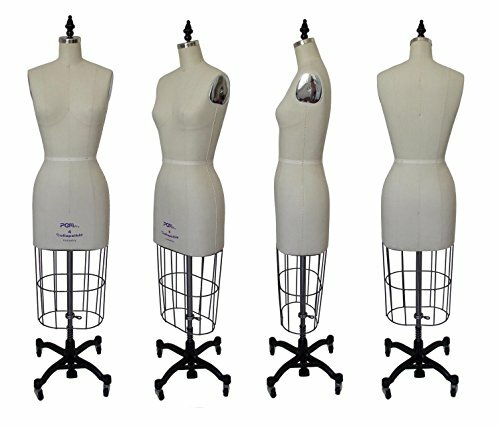 Ideal for Fashion Designers & Students, Shipping is around $50 anywhere in US, Standard Shipping takes 4-6 business days! 5 minutes Installation & 24 hours email support, Select Size 4 to 12, Email Size selection immediately after purchase! Original Price $399, Buy Now! We Ship to Canada for just additional $75 USD (No Custom Duty and Tax) If you are in LA, ask me about SAME DAY 2-3 hours delivery! If you are in NY, all it takes is 4-5 business days! Call 909-436-7215 for any product questions or shipping/return related questions!